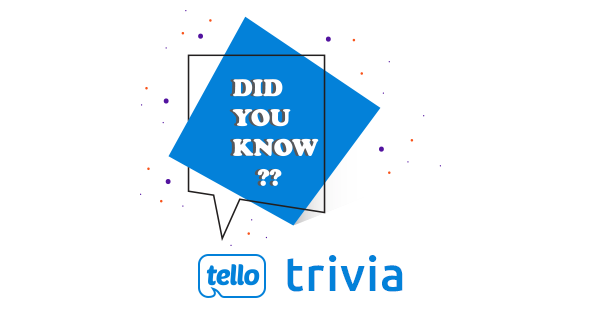 Tello Trivia Results: How Well do you know Tello Mobile? Tello’s Anniversary was so much fun! We had offers for newbies & existing customers, cake celebration at the office, giveaways and a highly anticipated launch of our Referral Program! Apart from all the exciting activities & news, we also ran a Tello Trivia to see how well our customers know our company. The results are in and as always, our clients prove to be as awesome as we remembered. We had lots of fun reading the answers and that is why we’re sharing them and revealing the truth behind the scenes. Enjoy! Q1: How many employees does Tello have? Our Tello Team counts more than 70 enthusiasts. They’re gift-addicted like Santa, but not so numerous as his X-Mas crew. Q2: What’s the average age of Tello’s employees? Hey, nice going there, perfect answer! Tello guys and gals are in their late 20s or are 30+. Wise enough to stay cool! Q3: How many languages does our CS team speak? This was a tricky one, we agree! We loved getting your opinions on this matter. The Support team speaks English, Spanish, Wireless and other languages that bring people closer, spice up life and keep the good mood ON. Q4: What are Tello customers called? This was something we wanted to know: how do our customers want to be called? The results make “Telloers” into the official term, but we always want to think of them as being Happy. If you have any other suggestion, feel free to let us know! Q5: What’s Tello’s ultimate goal? If you ever wonder what’s the ultimate goal for Tello, the truth is not out there, but right here, as ambitious as it gets. To turn Tello into the best Wireless service in the USA thanks to the custom-made plans and the low rates. Annoying the competition is just a side effect, not the target! Thank you all for being a part of our story, we couldn’t have done it without you! Here’s to many more anniversaries together! Love Tello. Had to let my service expire this month bc I got laid off but will be back ASAP! Thanks for the great service though!! Thanks for the kind words, Lisa! Hope everything will be better soon in terms of your job, fingers crossed! We’ll be happy to have you back, always! We didn’t think about this but it sounds really good! Tellovers it is, thanks! When I first joined with Tello, I wanted to get an area code 213 but 818 instead. The support team changed it to 213 without going thru hassle. It is so easy to view the website.